Sri Lanka's largest, private sector higher education network, ESOFT was selected Runners Up in the Education Services category at the 12th National Business Excellence Awards 2015. This highly prestigious, national level event is organised annually by the National Chamber of Commerce of Sri Lanka (NCCSL) to honour Sri Lankan corporate bodies who have excelled in their respective fields of business. A rigorous three-tier evaluation process was applied to rank the winners which included the review of applications by a technical panel, interviews and an assessment by an independent panel of judges. ESOFT's business practices were evaluated across eight areas, namely: Leadership Corporate Governance, Capacity Building, Performance Management, Local and Global Market Reach, Corporate Social Responsibility and Environmental Sustainability and Business and Financial Results. 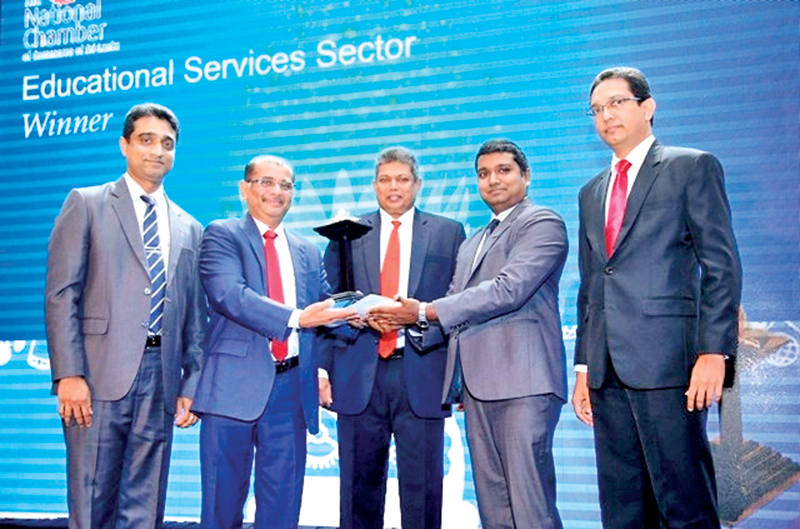 "This win reaffirms our position as a true market leader in the education services sector of Sri Lanka" stated Dr. Dayan Rajapakse, Managing Director, ESOFT Group of Companies. "Having started with the provision of IT courses in 2000, we have since diversified into other areas such as Business Management, Engineering, Hospitality and Languages. All ESOFT programmes are delivered by experienced educators who utilise a practical and industry led approach to teaching. This consistently produces globally employable graduates who are well equipped to meet the demands of the modern corporate world. Our extensive branch network of 45 centres across the island ensures that a large number of local and international students have access to a world class education at highly affordable rates. We are now in the process of extending this network internationally in order to reach an even wider community of students" he said. ESOFT has the distinction of delivering high quality programmes which are endorsed by leading educational establishments in the UK such as BCS (Chartered Institute for IT, UK) and Edexcel. As the only Accredited Course Provider for the BCS Higher Educational Qualification (HEQ) in Sri Lanka, ESOFT is also the only organisation in the world to hold this status for all three levels of the BCS HEQ. Furthermore, having produced an outstanding 50 plus World and Sri Lankan prize winners to date, ESOFT is the world's largest training provider for the BCS HEQ. Edexcel has also awarded the company Gold Partner status due to the large number of ESOFT students who successfully complete their Higher National Diplomas (HNDs) each year. As a strategic partner of London Metropolitan University (the largest single university in London) and Kingston University (ranked in the world's top 500 universities), ESOFT offers students the opportunity to pursue UK undergraduate and postgraduate qualifications right here in Sri Lanka at a fraction of the cost. Since every area of study at ESOFT comes with a clearly defined learning path, students can easily progress from O/L or A/L, all the way up to a post graduate qualification. Since ESOFT is a group of companies, many students who successfully complete their studies are offered internships and job placements within the group itself.